You have no items in your enquiry builder. What are BSP thread sizes? What are British Standard O-Ring sizes? Trading Hours Our sales staff are available between 9am and 5pm ACST, Monday to Friday. Enquiries sent by email or our website may receive replies outside of these times. Our factory has extensive displays of our product range available for viewing. 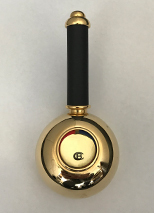 Current Pricing As of 2018 we recommend using the main CB website product pages for calculating pricing, the 2018 Virtual Price Book is still valid but you will find more details and newer metal finishes listed on the main website product pages. Ruling Price Book October 2018 Digital Book along with pricing on this website. All older pricing is no longer valid. 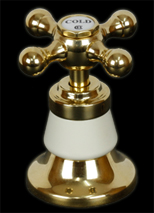 Consolidated Brass or CB Ideal Tapware. Our Instagram Feed We regularly now share photos on our @cbideal Instagram feed. These often are quirky or customised items, along with insights of how we manufacture our products. View the Specification tab below for further technical information. Price shown below on opening this page is RRP for Chrome Plate finish (CP). Use Finish Code drop-down menu to calculate the price for other metal finishes. Any Required Fields # must be selected to generate a valid SKU order code and valid price. 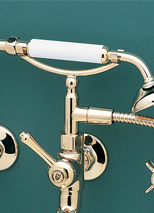 Olde Adelaide Shower Set with Roulette Handles includes the arm, 75mm ball joint shower rose, and two wall tap assemblies. I would like to choose a Roulette handle style variant. I want to customise this item. I want to customise the size of the shower rose. *Please select an option below. It must match the selected finish for a valid price / code. 3) Please also mention any selected options or additions (for example coloured inserts) from the product page. 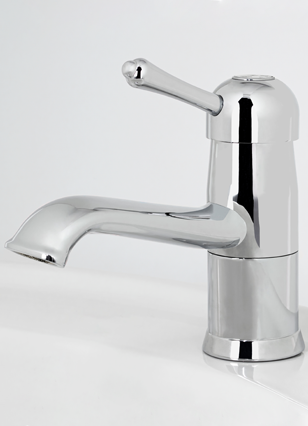 We can assist architects and specifiers to select suitable standard products or create tailored tapware and accessories to suit industrial, commercial, government and residential developments. We have experience working with developers across Australia and the Asia Pacific region, and as we control our own manufacturing capability in Australia we are able to more easily customise solutions to suit your requirement. 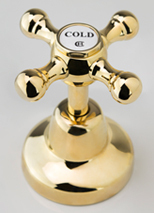 - water quality and hardness for a particular site. - required finishes and trims to suit the design. 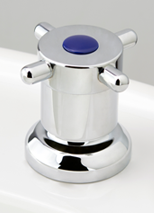 - special coloured or patterned inserts for levered tapware. 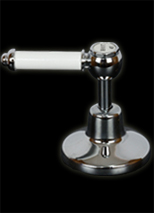 - modified or innovative shapes of water pipes. - adjusted spacing and sizing to suit space limitations. - customised flair, bathroom or kitchen accessories. 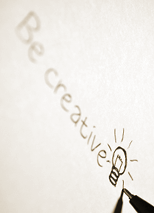 There are several ways we can work with you. This can be through our distributor network, over email, via Skype or phone or in person at our head office & factory, so please contact us to discuss your requirement and we'll be happy to help! 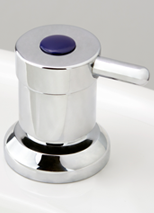 Coloured inserts allow for added flare for certain ranges of our tapware and our Heritage accessories. Our coloured inserts are not plastic or ceramic, they are made from brass. There are four types of coloured insert available in our ranges. 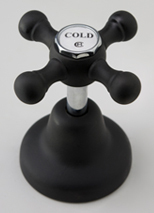 Options appear in the online catalogue where they are available for selection and addition to a product. 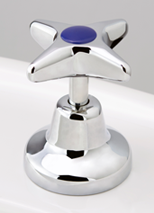 White inserts are clean and crisp, they can be very effective with all of our metal finishes. 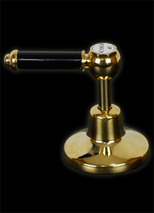 Gloss Black is forever stylish, and is pairs well with our gold, brass, silver and copper colour metal finishes. 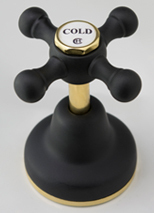 Matte Black is fresh and stylish, and is pairs well with our gold, silver and copper colour metal finishes. 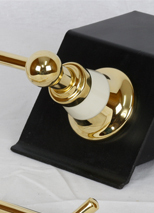 Almond Ivory inserts best compliment our brass and gold colour metal finishes. An all round pleasing Heritage colour, beautiful with our gold, brass, silver and copper colour metal finishes. Another all round pleasing Heritage colour which suits all metal finishes. 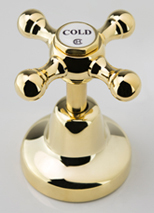 Have another colour you would like to compliment your new tapware or accessories? Please contact us and we'll do our best to assist. 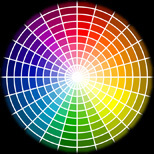 As a starting point the best reference of what may be possible is the Dulux Alphatec and Duralloy colour charts. Custom colours are priced on application. 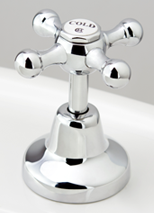 Rapid Action performs the same turning action as ceramic disc but the maintenance is cheaper and easier. - opens and closes in quarter to half a turn. 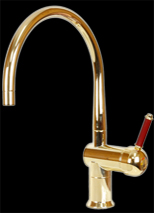 - is standard with all Roulette Lever (excluding Roulette Lever Single Lever Mixers), Torrens Ranges, Celestial Lever, and CB Ideal Seaview Series tapware. 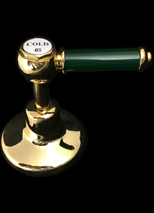 - is available with all other ranges on request (excluding Roulette Lever Single Lever Mixers & the DB Mixer Series) . - is suitable for low-pressure hot water supply, tank or bore with pressure pump. Why did we develop it? 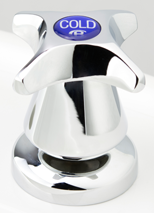 It uses a hydroseal valve and standard BS110 o-rings. 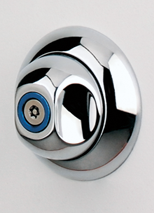 A handyman or handywoman can change a hydroseal valve in the same manner as a normal jumper valve, and it is available from hardware shops. Packets of BS110 o-rings are also available here. 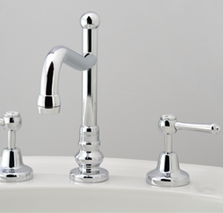 The ceramic disc system needs a plumber and the appropriate kit for the model tap. Question: What is Rapid Action? 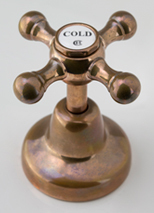 Answer: This term describes the mechanism which enables the tap to be fully opened or closed in less than half a turn. 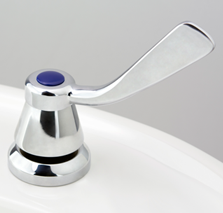 In conventional tapware the handle (A) turns the spindle (B) 3 to 4 full rotations up or down the thread inside the bonnet (C) and this raises or lowers the valve (D) which either lets water through the seat of the tap or shuts it off. 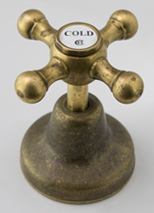 In ceramic disc tapware the valve is replaced by ceramic discs which slide over each other (think of the twist-caps on salt and spice dispensers). 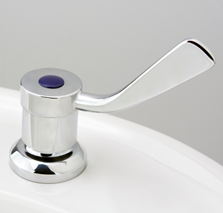 When the tap is closed the ceramic discs completely cover the tap seat; when the tap is opened the discs slide to cover each other and so leave an opening which allows water to flow. 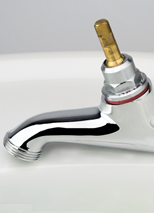 In ‘Rapid Action’ tapware the handle (A1) turns the spindle (B1) up or down the specialized and very accurately machined thread inside the bonnet (C1), which enables the spindle to rise to the full open position in less than half a turn of the handle. 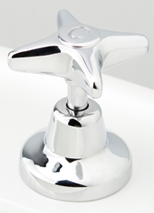 The valve (D1), which therefore either completely opens or closes the tap seat, is of a specialized type, and very accurately manufactured, which provides a perfect seal when the tap handle is closed (without the need for extra-hard turning of the handle which often happens with conventional tapware). 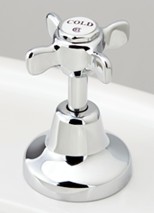 ‘Rapid Action’ tapware demonstrates high quality and accuracy of manufacture, and the design also allows for ease of maintenance. 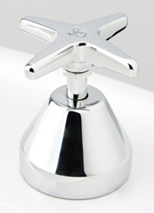 The Hydroseal valves (available at all good hardware stores) can be changed as easily and quickly as in a conventional tap. Packets of BS110 o-rings are also available here. Because there are a number of different ceramic disc systems on the market (all imported) it can be quite difficult to find and then fit the exact replacement part when the need arises. 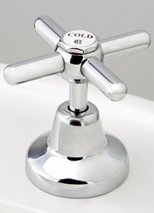 Question: Do ‘Rapid Action’ taps turn on and off the same way as ordinary taps? If they look like ordinary taps, they turn like ordinary taps too – both hot and cold turn on anticlockwise and off clockwise. With lever tapware (Celestial Lever, Torrens Lever, Torrens Flared Lever and Roulette Lever) the hot tap turns in the opposite direction to the cold. 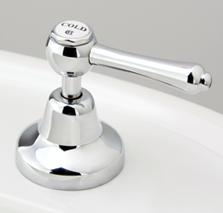 Question: Does ‘Rapid Action’ Tapware turn through a quarter turn or a half turn? Answer: More than a quarter turn (because a quarter turn gives no graduation – the water is either off or on) and less than a half turn (because this would make the longer levers very uncomfortable to use). 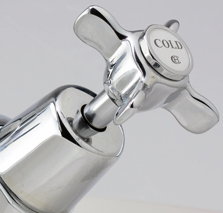 Question: Is ‘Rapid Action’ Tapware suitable if there is low-pressure hot water supply, or if the supply is from a tank or bore by means of a pressure pump? Yes, because the design allows the full flow that is possible through the seat of the tap when the tap is fully open. 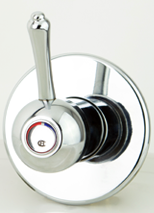 Ceramic discs restrict the flow somewhat, even when the tap handle is in the fully open position. 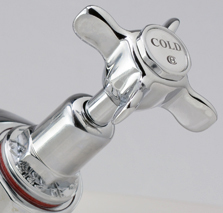 When the hot water supply is low pressure and the cold water is at high pressure, it may be more difficult to achieve a comfortable mixture because there is not enough graduation in less than half a turn to control the high pressure cold water – in such a situation a conventional CB standard action tap would probably be more successful. 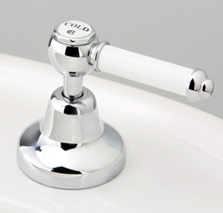 When upgrading Bib / Pillar Spindles on Heritage from Standard Action to Rapid Action, the look will change from the standard Heritage® bell shape bonnet to then use the sheath cover from the Roulette® Series. As of the 12th of March 2015, we, CB Ideal Tapware Pty Ltd have upgraded our standard warranty from 12 months to 5 years per the terms outlined below. This warranty statement superceeds that shown in the 2014 Price Book and a copy is included with applicable products sold after this date. We (the above-named Company) accept responsibility for any fault due to our own materials or workmanship except for subjective variations or random unavoidable blemishes of a minor non-functional nature. This acceptance of responsibility is for five years from date of installation, proof of which may be required. 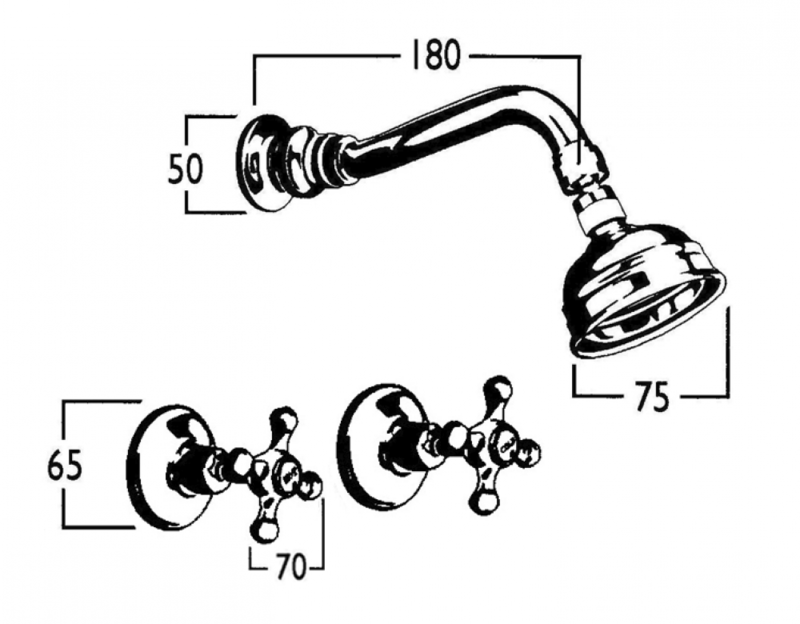 The product (concealed or exposed) will be repaired or replaced at no cost, provided that in-wall fittings are fully tested and have also been manufactured by the Company. 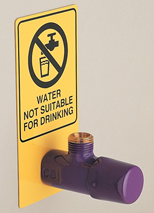 This warranty does not cover misuse of the product or damage incurred during installation. Our products are made to Australian Standards and are designed to be used to a maximum temperature of 65 degrees celsius and to a maximum pressure of 500Kp. The warranty is voided if the product is used above these limits. To make a claim the consumer should return to the seller of the product for advice, and to establish proof of purchase. The seller will then contact us, and our representative will contact the consumer to arrange whatever after-sales service is required. The consumer’s cost for making a warranty claim (e.g. freight) is discussed at the same time. 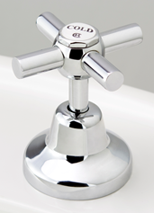 CB Ideal Tapware Pty Ltd. The company provides installation instructions for certain products as a guide to the qualified tradesman/installer, but accepts no liability whatsoever for faulty installation. The Company provides care instructions for various finishes; however because the actions of the user are outside the Company’s control it accepts no liability for deterioration of finishes outside the warranty period. Please consider the following factors before the warranty is invoked. • Any work on the water pipes can cause grit or shavings to be inside the pipes. 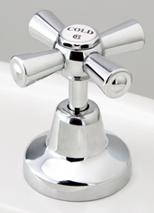 Usually pipes are flushed to remove debris, but if any remains it may lodge in the aerator or underneath the tap valve. • The aerator case has a fine thread. If the aerator has to be removed then great care should be taken to ensure that the thread is not crossed when the case is replaced. 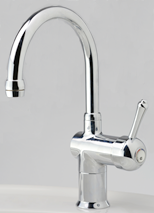 • Lever taps are set correctly in our factory, but may need to be reset if altered during installation. The leaflet included with each lever set explains this very simple operation which is really part of the installation process. This is provided as a quick reference tab for the different spoke styles available for the Roulette handle. More information can be found on our Handle Styles Guide in our FAQ section.